A study conducted by the Cardiff University School of Dentistry in the United Kingdom found that a large number of children aged 12 to 14 years old regularly drink sports drinks. The surveyed children admitted to drinking one to seven sports drinks a week for purposes other than energy and athletics. This is problematic for several reasons. Sports drinks are specifically designed to enhance a person’s athletic performance. They are high in sugar and have a low pH level. The make up of these drinks can easily lead to an increase in cavities and dental erosion, not to mention a slew of other health issues. Approximately 18% of the children said they used the sports drinks for sports and energy. This means that the majority of young drinkers are not using sports drinks as they were intended. If consumed in excess and not for the purposes of enhanced athletic performance, sports drinks can have serious adverse effects on the body. The consumption of sports drinks leads to a higher level of acid in the mouth, resulting in faster demineralization of the enamel of the teeth. 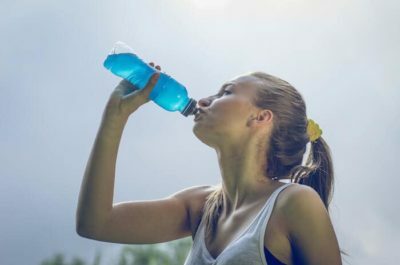 Even if athletes drink sports drinks for the right reasons, they should be aware that the acidity level, plus the dehydration associated with exercise, can leave teeth especially vulnerable to erosion. Dehydration leads to a decreased amount of saliva in the mouth. Saliva helps to wash away acid and protect the teeth. If you drink sports drinks or have children who drink sports drinks, it is important that you consider the consequences. Additionally, take the time to speak to your dentist. They can help you determine the best way to protect and care for your teeth.